Tested from: Got it mid Jan. 2014. Finally spoked in and tested since 2-4-2014. 2013-7-5: SP's upcoming PD-8X dynamo hub is for the new market of 15mm axles, but it's supplied with an adapter for standard fork ends. For this hub SP has redesigned the dynamo part resulting in a claimed increase in efficiency of 7% over the PD-8/PV-8. This is an incredible achievement if true... I talked to a friend of mine yesterday who was at SP and they showed the difference in action, but note that though such an increase in efficiency is technically a big deal, in actual use it won't be. You just won't notice the small losses of just about any dynamo hub (see the calculations at the end of this page to show that half a Watt won't slow you noticeably down, wind has much more effect...) Well, except in that the more loss, the more power you must provide and this results in stronger jolts. So the efficiency increase could mean that a 26 pole hub (if it is 26 pole, not sure yet) is equivalent to a 28 pole hub in jolt strength. User serviceable: No, perhaps when making one's own tools? 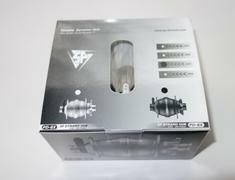 If the bearings wear out after the warranty, that can be done for a cost of $30, there is a service centre in Germany (possibly others, I will see). A few months ago (ca. Sept. 2013) I was told by a friend of mine who already had a PD-8x that the rotation direction makes a difference in how strong the resistance to turning it (at each pole) is, and I can indeed feel this. In the rotation direction to be used, the hub can be rotated more easily than the other way around. Will this mean that vibrations in the handlebar are less than the PD-8? The efficiency increase should also help in this respect, but I will see when I do my test. The hub's price is about $200, and I was told that the main reason for the price difference with the PD-8/PV-8 is the increased cost due to narrower tolerances of the components and in the build process of the hub. The hub that I have doesn't have an StVZO approval number yet. 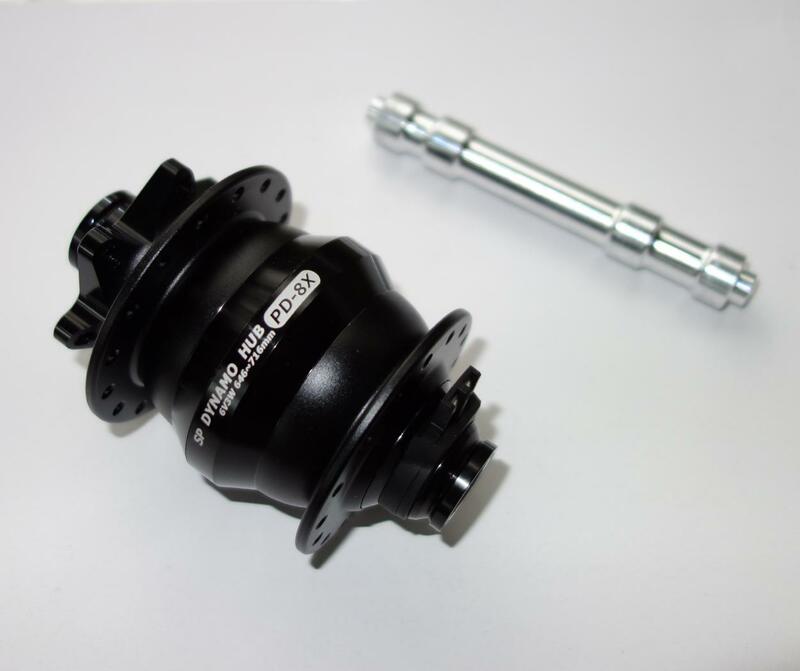 The hub comes with an adapter for standard axles, and rotates freely inside the hub. The hub's axle-ends don't have any ridges to grab the fork, so how will that work? 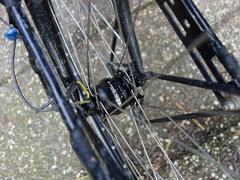 Will there be enough friction to make sure the hub doesn't rotate in the fork? Finally built it into a wheel on 2-4-2014: First test ride was uneventful. I took the standard bike I use for vibration testing, with the standard headlamp for vibration testing (Edelux-2008) onto several roads of varying asphalt quality and I could not discern vibrations at any speed. I made sure to get maximum attention by not watching ahead but even riding blind for a while at various speeds and switching the headlamp on and off (this will give a sudden jump in vibrations, so that makes it much easier to say "vibrations are present" or "I can't feel vibrations"). Well, I couldn't feel anything at any speed, I tried several times up to almost 42 km/h. So then I put in the wheel with the PD-8 again in this bike and the first road I tried the vibrations were clear, when switching on/off it was completely clear. The difference between PD-8 (and thus also PV-8) and the PD-8x in this respect is huge. I would think that this means the PD-7 is no longer the king in this respect, but just to be sure that I haven't lost my 'feel' of the vibrations, I will do a comparison with the PD-7 soon. I will also go ride with the PD-8x on the smoothest asphalt roads to see if under those circumstances I can feel it. Note that on really smooth asphalt I can suddenly notice a dynamo hub in sunlight, when riding on smooth aspahlt and then riding through the shadow of a car or a house which means the headlamp (if auto on/off) suddenly goes on and the vibrations start. I will see about this the coming weeks as I'll be using the PD-8x mostly. I fastened the hub with Intelligent-Design skewers (inner hex, and the ends fit into the fork's slot, they work much better than quick releases for dynamo hubs, especially no rotating hub from having the skewer 'too loose'), and I didn't have an issue with the hub rotating. 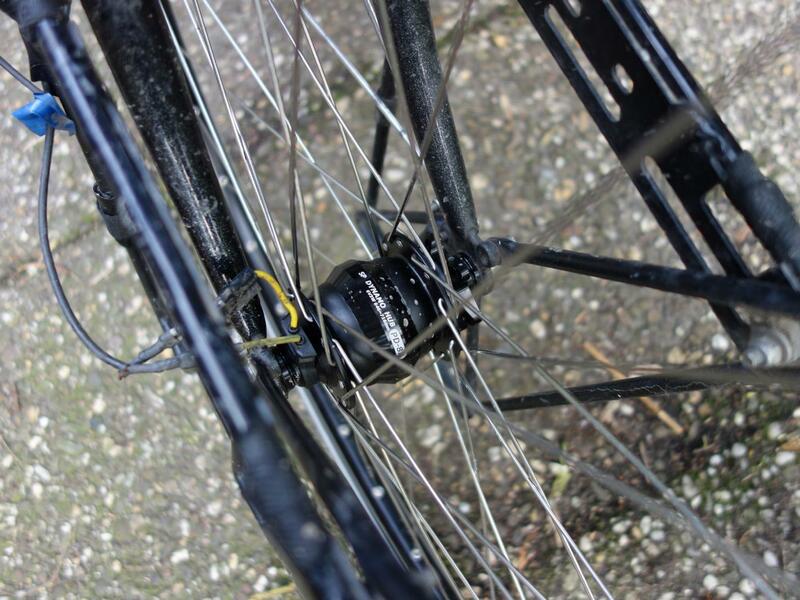 2014-4-9: Further rides confirm that I cannot feel the hub at all, and also it doesn't rotate in the fork which is something that worried me. I'd still like to see another solution that eliminates such issues namely non round axle ends that fit into the fork as I mentioned in another review. Regarding points 1 and 3 SP has succeeded extremely well. The PD-8/PV-8 are already far better in vibrations than any other except SP's own PD-7/PV-7, and the PD-8x is the best. Regarding point 4: With the PD-8/PV-8 SP succeeded in providing a product equal in efficiency to the SON28 for a far lower price. If SP's claims are confirmed, the PD-8x improves on this and then it stands alone at the top regarding efficiency, with a very big margin now. But the price is getting closer to the SON28... (and it doesn't have the bellow system). Then we come to point 2: The trend towards non-user serviceable equipment in taillamps, headlamps, and dynamos is not good. In bottom brackets I suppose the whole thing can be considered a throwaway wear-dependent part, with dynamos and lights this is not the case. This regression from esp. older lights is unfortunate. Sidewall and roller dynamos were never really properly user serviceable but they were also usually cheap and small so could be considered something to be replaced once worn out I suppose. With hub dynamos the prices are such that bearings should be replaced, not hubs replaced. SP and Schmidt have service centres, but what about bike shops? SP claims the tolerances are such that users can't service the bearings themselves. Why not? The tricky bit was the making/gluing/placing of parts such as the rotor and magnets in specific positions, which should not be affected by disassembling a hub. If so then I consider it a design flaw... To see about this, I am working on disassembling and taking out bearings of a PV-8, and then fitting them back again swapped, to see what happens... I will also add a section on dynamo hub servicing to my site. 2014-5-18: Experiences after lots of use: Having used it for about 6 weeks I can now feel the vibrations on very good asphalt, but only if not wearing gloves! The vibrations are almost like the background noise from the road, so almost negligible on my test bike and gloves are enough to make them disappear for me. Perhaps the SD-8/SV-8 are just a bit better, but those are lower power output dynamos so not really competition. So, I left my test bike, which I use and abuse by letting it stay outside all year long in the rainy weather here in NL, lying on its side many times, in the very stormy winter of 2015-2016 and water got into the hub. This will happen with just about any hub, so this is a problem that you should be aware of with dynamohubs in particular. Water getting into a normal hub can be dealt with and doesn't do much harm besides rust, but in a dynamo hub in winter, the water freezes and the rotation of a 'block of ice' can then kill wires. It seems this is what happened with my PD-8x. I first removed the 15mm converter, which was fixed from the corrosion of the aluminium. Corrosion is a big problem with non-anodised aluminium, and the hub's axle and this converter showed this problem (white powder).